6 Major Wedding Vow Don’ts | Wedding Ideas ARE YOU A VENDOR? 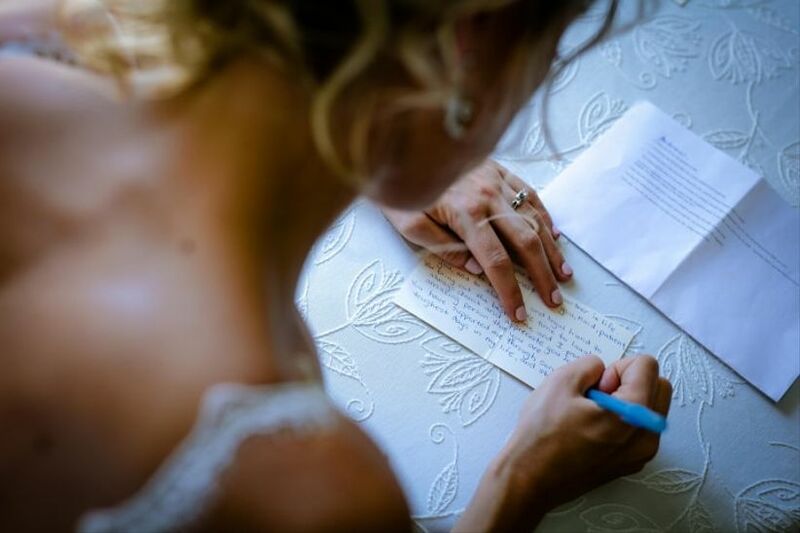 Working on penning your wedding vows? Try your best to avoid these pitfalls to ensure you’re ceremony-ready. Writing wedding vows ain’t easy. In fact, it can be quite the challenge, especially for those who weren’t blessed with Shakespeare’s eloquence. Before you sit down and try putting pen to paper, you should know what not to do. 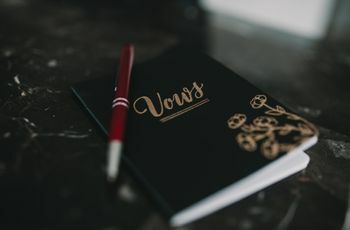 From skipping the comedy routine to watching your word count, there are definitely a few no-nos in the world of vow writing that you should get well-acquainted with. Here are a few major wedding vow don’ts. These are your wedding vows, not a TED Talk. Keep them short, sweet and to the point or you may have your guests - and possibly even your partner - yawning and staring at the clock. Around two minutes is the norm, but if you really need to add that extra line or two, you can tack on a bit more time. Your wedding vows are meant to be personal, but don’t get too personal. Keep in mind that you’ll be saying them in front of your nearest and dearest, so maybe save any stories that’d warrant a rating above PG for when the two of your are alone (your grandma probably doesn’t want to hear them!). 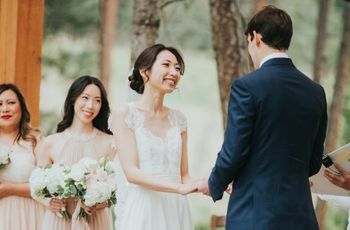 While it’s fine to pepper in some jokes, you don’t want to turn your wedding vows into a full-blown stand-up special - you’re not Ali Wong or Colin Mochrie. Try to find balance between the comical anecdotes and the sweet and sentimental stuff - it’ll make your vows much more meaningful. So, you think you’ve written some seriously swoon-worthy vows and you’re all done and dusted? Well, hold on just a sec! 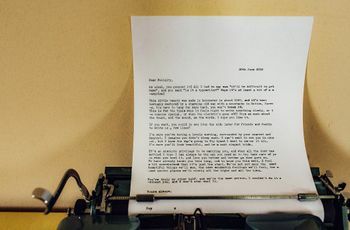 Before you hit print, make sure that you’ve made some actual wedding vows in your speech (yup, it is possible to forget ‘em). We suggest going with a mix of simple things (like promising to unload the dishwasher every night) and super sentimental promises (like vowing to lift your S.O. up when they’re feeling down). 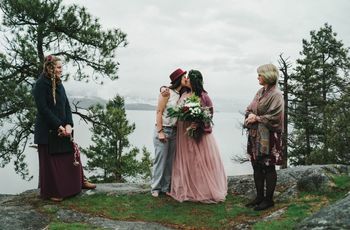 It’s not cheating if you ask for help from your officiant, work with a celebrant or look for inspiration in books or in songs (hint: Ed Sheeran’s lyrics are a great place to start). Not everyone is born with the gift of the gab, so don’t feel bad about using your resources. If you’re really stuck you can even work with a template to create your wedding vows, just remember to put your own spin on them to make your speech more personal. Now’s not the time to test your improv skills! Even if you work great under pressure and thrive in front of a crowd, you shouldn’t be ad libbing your vows on your wedding day. This is one of the most important speeches you’ll make in your life, so it deserves a little bit of TLC. 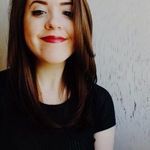 If you’re super confident, you can ditch the cue cards, but you should have a plan for what you’re going to say when you’re up at that altar.